4-Word Review: Extortionist blows up rollercoasters. 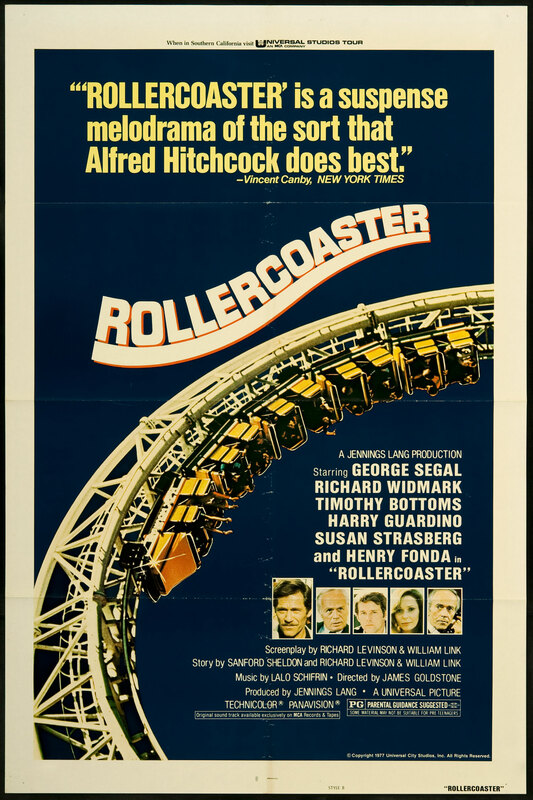 A young man who is never given a name and is played by Timothy Bottoms is able to make home-made radio controlled bombs that he attaches to roller coaster rides at amusement parks. He threatens to blow up a major one during a big event unless he is given 1 million dollars. It is then up to Harry Calder (George Segal) the chief investigator to find the extortionist and the two end up playing an elaborate game of cat-and-mouse. The film’s pacing is poor. It opens with the extortionist blowing up a roller coaster and Segal coming to investigate and then all of a sudden it cuts to an uninspired ten minute segment involving Segal’s family life before it finally gets back to the investigation. Outside of seeing a young Helen Hunt as his daughter, the family scenes offer nothing and should have been scraped completely. Despite having ‘disaster epic’ written all over it the filmmaker’s unwisely decided to make this more of an ‘intellectual thriller’ with very little action or special effects. The only real action/special effects come at the beginning when Bottoms blows up a coaster and everyone on it comes crashing down. However, it looks too sanitized and fake as it is far too obvious that it is dummies inside of the coaster cars and not real people. As the villain Bottoms has got to be one of the dullest you will ever see. Absolutely nothing about him is interesting and there is no back story given as to why he is doing this or how he manages to be so very clever. Henry Fonda is wasted in a ridiculously small and insignificant role and one wonders why he would have even taken it. Segal plays his part with a good ‘everyman’ quality that makes him easily relatable and it is nice to see him living in an apartment that is reasonably sloppy. It is also fun to watch him ride a roller coaster while everyone else is screaming he just sits there looking bored. Richard Widmark is equally good and possibly at his most gruff and abrasive and the sparing relationship that he has with Segal is entertaining. The intricate cat-and-mouse game that Segal plays with Bottoms isn’t too bad either. There are a few impressive shots where the camera is mounted on the front roller coaster car and then is glided along the tracks at high speeds giving the viewer of a very realistic feeling of actually being on a roller coaster. Ultimately the film just does not live up to expectations and needed more special effects, more action, more suspense, and just plain more disaster. The bad guy should’ve been more distinctive and a much more prominent role for Fonda as some feel he may be one of the great actors of all time so if you got him use him. This entry was posted in 70's Movies, Disaster Flicks, Thrillers/Suspense and tagged Entertainment, George Segal, Henry Fonda, Movies, Review, Richard Widmark, Timothy Bottoms. Bookmark the permalink. Been wanting to see this one. Even with a not so great review I’ll still try to check it out. I’ll be interested in getting your take on it. I saw this as a kid at the movies but have never re-visited it. I may give it a re-watch. Good review! I saw this on TV as a kid and loved it. The Carnival / circus music at the beginning and end is creepy given the subject matter, it really sticks with you. All this talk of Rollercoaster made me pull it off the shelf last night for a great Friday night movie, in a labor of love and a present to all my buds at the movie blogs, I’ve just posted 37 cool screenshots.. http://tommyshouseofhorrors.blogspot.com/2014/01/a-special-post-for-my-movie-blog-pals.html .. we now return you to reality..